At some point during the &apos;Kofun period,&apos; &apos;Yamato sovereignty&apos; (the ancient Japan sovereignty) was established as the unified authority of &apos;Yamato (ancient Japan). &apos;Historians and other experts considered that this &apos;Yamato sovereignty&apos; provided to the powerful families or clans of Japan the permission to build the keyhole-shaped mounds; it was through this mound permission process that a unified authority was established. In the latter half of the third century and onward; large keyhole-shaped mounds which were considered to be imperial mounds, were significantly scaled up from the mounds in the early &apos;Kofun period&apos; and appeared in Nara Basin. Then, from the middle to end of the fourth century, in a fifty year period, four large keyhole-shaped mounds of the &apos;okimi&apos; (great king) class in scale of size were built in the Saki (also pronounced, "Sofu") region of the Northern Nara Basin. 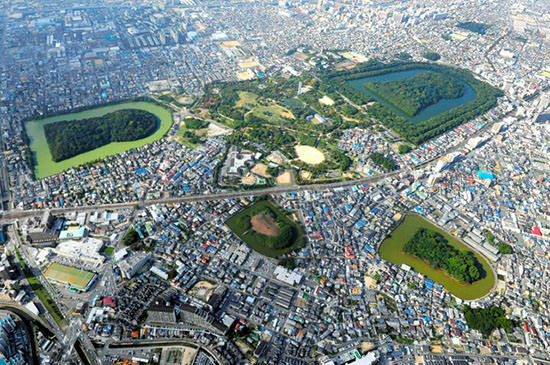 Furthermore, a gigantic &apos;Kofun&apos; (tumulus) was built, taking nearly one century to construct on the Kawachi Plain by future generations of the regions subjects throughout the fourth century. Finally, at the end of the fourth century, advanced tumulus communities appeared in one area of the Kinai region (the five capital provinces surrounding the ancient capitals of Nara and Kyoto). There were numerous gigantic &apos;Kofun&apos; (keyhole-shaped mounds) continuously built throughout Japan during the mid fifth century. However, it was around end of the sixth century that keyhole-shaped mound building ceased in Japan. After the establishment of the &apos;Yamato&apos; sovereignty,&apos; central and local political systems were established within Japan. Historians and other experts believe that the disappearance of the keyhole-shaped mounds, during this historical period, was dependant upon and directly related to the impact of &apos;Yamato sovereignty&apos; gaining greater political power. For a while afterwards, the construction of square tumulus and circular tumulus continued. 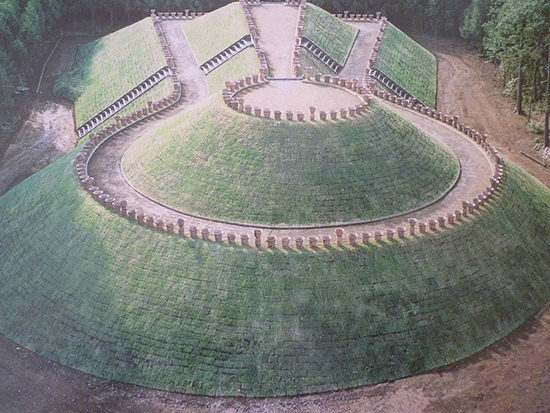 For royal tombs of &apos;okimi&apos; (great king), specially octagonal tumulus were constructed. Japanese external relations in this historical period, the fourth century onward, included militaristic advances upon the Korean peninsula; this resulted in the subjugation of the Silla (an ancient Korean Kingdom) and Paekche (an ancient Korean Kingdom), and furious battles with Goguryeo (an ancient Korean Kingdom). Inscriptions on the &apos;Gwanggaeto Stele&apos; (Gwanggaeto Stele was built in &apos;411&apos; by King Jangsu of Goguryeo Jian, Jinling Province, China) and other documents support these historical events. In the fifth century, the five kings of Wa (yamato, ancient Japan) dispatched envoys to China. 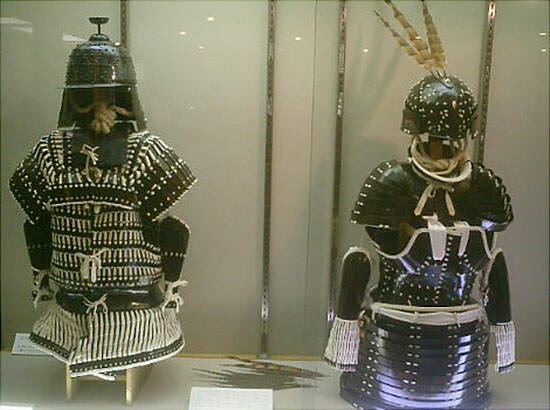 Wa, authorized the use of iron acquired from the Korean peninsula to make farming tools, kacchu (armor) and weapons. Japan imported and assimilated some aspects of the Chinese and Korea cultures such as: written Chinese characters ("kanji" in Japanese), Buddhism, and Confucianism. 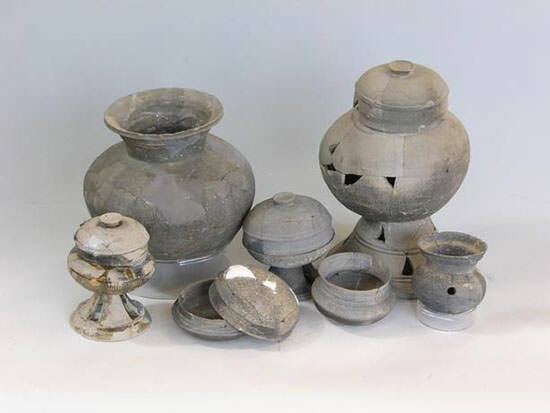 It was in the &apos;kofun period&apos; that the People of Japan used Hajiki pottery (unglazed ceramics) and sueki pottery (unglazed ceramics). 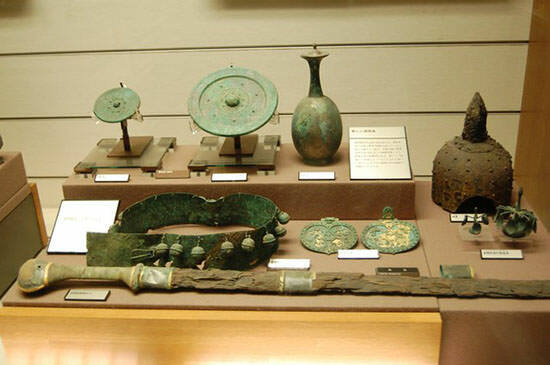 Additionally, in the Zuisho (Book of the Sui Dynasty), there were reports confirming Wakoku&apos;s (ancient Japan) affluence and possession of rare goods following the conquest of Goguryeo and Silla. 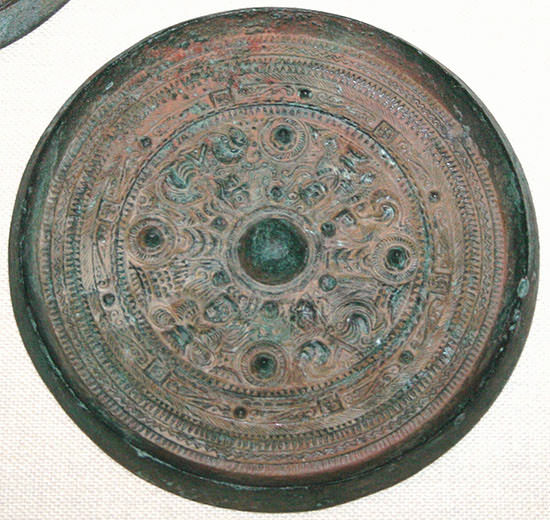 Bronze ware was introduced to Japan from the continent (Asian continent), but unlike other ancient Oriental regions the inception of iron ware usage was closer to the introduction of bronze ware. Thus, the bronze ware of Japan would not be implemented widely; Japanese people abruptly replaced bronze with superior efficient iron ware. Therefore, the Japanese people would have limited use for bronze ware: such as Bronze bells for Saishi (religious service) and other religious practices. At the end of the third century, one of the Yayoi period&apos;s burial systems was called the funkyubo (grave mound or tumulus) [tombs of Shucho (head of an organization, chief)]; these tumulus appeared all over western Japan, and those funkyubo would have contained unique tsubogata doki (jar-shaped pottery vessels, unglazed earthenware) and kidaigata doki (stand-shaped pottery vessels, unglazed earthenware) inside. Later in this early &apos;Kofun&apos; period, a circular tumulus appeared and was positioned as a precursor to the keyhole-shaped mound; then another &apos;Kofun&apos; development was of a large square tumulus, and this appeared only in the distinctively cultural sphere of Izumo Province; also, this large square tumulus seemed to be developed from yosumi tosshutsugata funkyubo (square mounds whose four corners protruded outward). The oldest &apos;Kofun&apos; found during the historical period, was that of the Onari Tumulus in Yasugi City, Shimane Prefecture. Additionally, a rare sokantotachi (iron sword with a ring pommel) was excavated in this early &apos;Kofun&apos; period. Later, large keyhole-shaped mounds, which were about same size as an okimi ryo (great king&apos;s or Emperor&apos;s tomb), were constructed in the concentrated regions of the Nara Basin. These &apos;kofun&apos; interment facilities were structured with a vertical style stone chamber, and burial goods were contained inside: Magical goods, mirrors, gems, swords, and stone objects in addition to iron farming tools. At the same time, the Japanese people produced ento haniwa (cylindrical clay figure) figures enthusiastically; as well as Haji pottery made in the Kinai region which led to Haiji pottery production spreading out into the many regions of Japan. Later, kizai haniwa (a collective name for tool shaped clay figures, such as; a silk umbrella, a shield, a quiver, and armor) figures and iegata haniwa (a house-shaped clay figure) figures appeared in this historical period. In the early fifth century large keyhole-shaped mounds appeared; these Kofun were similar in size to the Obo class (tomb of the King or Emperor) mounds, located upon the Kawachi Plain from within the regions of the Nara Basin. Further, these Kofun became enormous; and it was at this point that a haniwa figure of a man first appeared. It would be during the middle of the fifth century, a vertically constructed stone chamber became relatively wider than a previous shape (It was used to be a long and narrow shape), which was an interior structure of a large class Kofun (ancient burial mound), and was implemented in the Kanai region; the Kofun would have been designed to house a stone coffin, shaped in the form of a large oblong chest (for clothing, personal effects, etc. ). 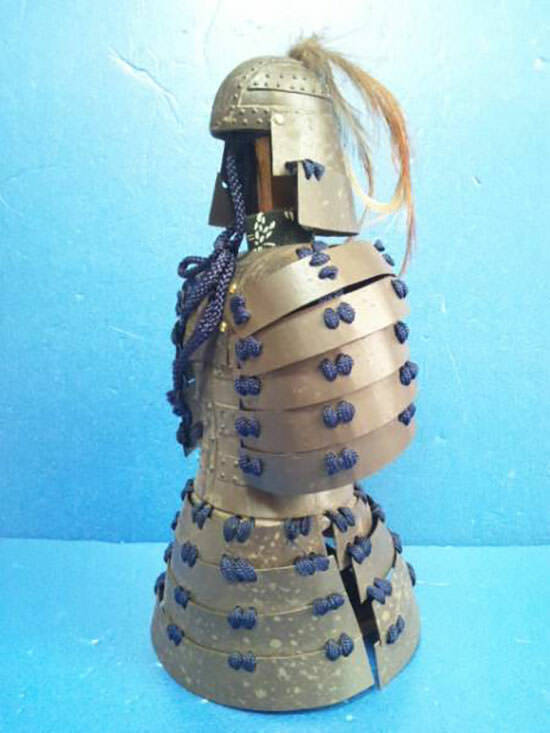 Kofuns of gigantic dimensions appeared in several locations, and a large portion of the burial goods inside these Kofun were composed of militaristic objects; such as: Harnesses, kacchu (armor), and swords. 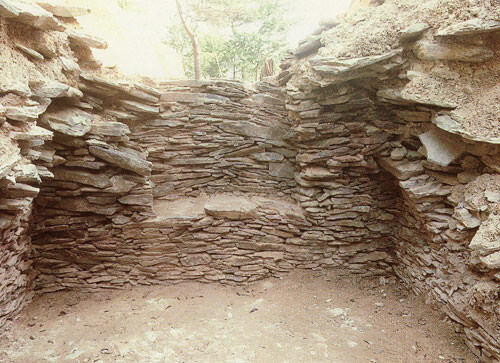 In the late half of the fifth century, Kofun mounds in the northern part of Kyushu and the Kinai region increasingly adopted the horizontal stone chamber structural style. Some of these large Kofun mounds in the northern part of Kyushu were designed with stone carvings of human shaped forms ("sekijin" in Japanese) and horse shaped stone carvings ("sekiba" in Japanese) in their Kofun mound sites. Additionally, around this same time period the Japanese people started to produce objects and tools: Sueki (unglazed ceramic-ware), Kyoku jin gama (a curved blade reaping hook), a U-shape edged spade and hoe, all were to appear in the southern part of Osaka Prefecture. It would be at the end of the fifth century that advanced clustered tumuli mounds appeared in one section of the Kinai region, and house shaped stone coffins were introduced inside these large Kofun mounds. The Japanese people began construction of underground vertically chambered tombs in the southeast Kyushu region and northern region of Kyushu; it was then that the soshoku kofun (decorated tombs) appeared. Shucho Kofun mounds of enormous size were built in the some parts or regions in Japan. In the early half of the sixth century, the people in western Japan enthusiastically constructed a horizontal stone chamber inside the Kofu mounds of western Japan. People of the Kanto region also constructed horizontal stone chambers. Meanwhile, stone carvings that were human shaped ("sekijin" in Japanese) and house shaped ("sekibe" in Japanese) were rapidly decreased in popularity in the northern part of Kyusyu. Imashirozuka Tumulus (Takatsuki City, Osaka Prefecture: True burial mounds of Emperor Keita, 190 meters long)Kawachi Otsukayama Tumulus (Matsubara City, Osaka Prefecture: length of the tumulus is 335 meters long. )Okimi ryo at the end of the keyhole-shaped tomb mound periodMise Maruyama Tumulus (Mise Maruyama Kofun: It is apparently the burial tomb mound of Emperor Kinmei; the total length is 318 meters long, Kashihara City, Nara Prefecture)Bidatsu ryo Tumulus (Bidatsu ryo Kofun: The total length is less than 100 meters: The last keyhole-shaped tomb mound of Okimi ryo)In the later half of the six century, people in the northern part of Kyusyu enthusiastically constructed soshoku kofun (decorated tombs) in northern part of Kyusyu. Haniwa figures decreased in their popularity in the Kinai region but increased in popularity in the Kanto region. 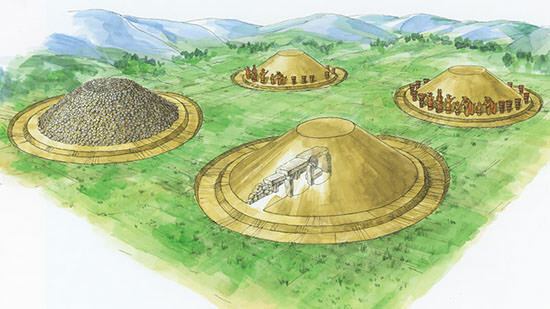 The people of western Japan enthusiastically constructed clustered tumulus mounds in the western Japan. Through out Japan toward the end of the sixth century, construction of keyhole-shaped tomb mounds ceased. For a while, the people of the Kinai region continued in their construction of square tumulus and circle tumulus mounds; this period is known as the final stage of Kofun period. Analytical research of the excavations by historians and other experts resulted in the conclusion that there were two political forces at the end stage of the Yayoi Period; one central force was in the northern part of Kyushu, and another central force was in located in the southeastern part of the Nara Basin. Historians and other experts believed that the Yamato sovereignty&apos;s establishment was based upon either one of two parent political organizations during the middle of the third century. However, the results of archeological studies strongly indicate that the political power in the Nara Basin was joined to the political powers of the Kibi; later, these conjoined powers would form the basis of the Yamato sovereignty. Although some scholars expressed the opinion that a powerful force in the northern part of Kyushu lorded over the Nara Basin, and subsequently moved their capital into the Nara Basin; this theory gradually lost academic support. Following the establishment of the Yamato sovereignty, tomb mounds (large keyhole-shaped tomb mound), which were greater in scale than any previously constructed tomb mounds, appeared in Japan and were concentrated in the Nara Basin. During the end stage of the Yayoi Period, local customs developed in their own distinctive styles of burial systems; this would have been unique in regions such as: Kinai, Kibi, Izumo, and Tsukushi (please refer to burial system of the Yayoi Period). However, a burial style in the form of a large keyhole-shaped tomb mound seemed to be the unifying form taken into practice, within the uniquely local characteristic styles. Therefore, historians and other experts believe that the Yamato sovereignty must have been established because various local political powers were joined together. Historians and other experts believe that the Yamato sovereignty was based within the Yamato region, this would have been where Yamato was headquarter, and rule extending from the southern part of Honshu to the northern part of Kyushu. Yamato sovereignty evolved into the representative political power of Wa (ancient Japan). Then, during the process of power expansion there seemed to have been conflicts with tribal elements, and powers, large and small. There were transcribed statements referencing examples of conflicts with others over the power of Yamato sovereignty [tale of the Yamato Takeru (no mikoto)] in "Nihonshoki" (Chronicles of Japan), but no details of this process were available to us. There were no written articles about the Wa in Chinese history books, since the year &apos;226. &apos;However, one and half centuries later, in the year &apos;413&apos; of the early fifth century there was a transcribed record confirming Wakoku&apos;s (ancient Japan) presentation of articles of tribute to Emperor An of the Chinese Dynasty; this was written in the "Jin shu (History of the Jin Dynasty)" in the period of Emperor An. In the year &apos;421,&apos; there was an article written about the "King of Wa San (讃)" in the "Sungshu (Book of the Sung dynasty) Wakokuden. "After this first article, there were many more articles written about the Wakoku (ancient Japan) in Chinese books on history; then after the San (讃), came acknowledgement of the Chin (珍), the Sai (済), the Ko (興) and the Bu (武). This is the "The five kings of Wa. 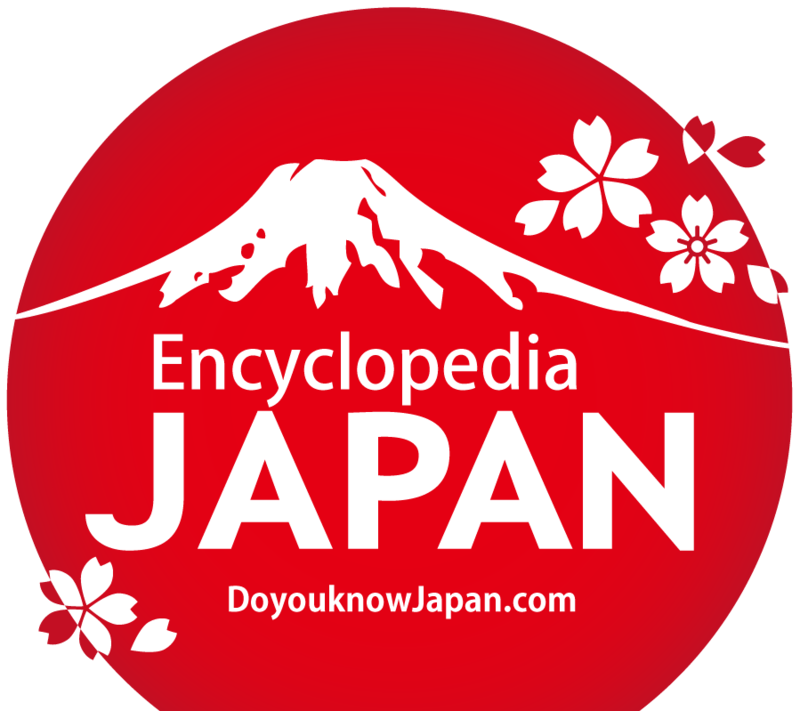 ""The five kings of Wa" were to of been identified as each Emperor represented in the Nihonshoki. Although this identification of these five kings was not irrefutable, as an example, Waobu (the last king of ancient Japan) was to be considered as the Emperor Yuryaku. King Bu presented documents to the emperor of China, depicting achievements in the unification of the Wa Sate, and detailing episodes of struggle, in the long history to unify, generation after generation, in Wa&apos;s ancestral past. An observation establishing the time period was taken from a small segment of Emperor Yuryaku&apos;s rule, as indicated in artifacts and historical logs: The written letters inscribed on the iron sword, which was excavated from Inariyama-kofun Tumulus in Gyoda City, Saitama Prefecture: The written letters inscribed on the long sword, which was excavated from the Eta Funayama Tumulus in Tamana City, Kumamoto Prefecture. Two names identified of the written letters on those swords were "jyotojin (a military officer who protects an Emperor or important personal)" and "tensojin (an officer who deals with paper work and records of the Imperial administration)," and these only referred to their occupations, so historians and scholars could conclude that the "Be (ancient political naming system)" system was not established as yet, at the end of the fifth century. On the other hand, the written letters inscribed on the iron sword, which was excavated from the Okadayama Tumulus in Matsue City, Shimane Prefecture, "Nukatabe-no-Omi (chief of Nukatabe group)" indicated that bemin sei (a political naming system of the Yamato sovereignty) was enforced in the middle of the sixth century. In addition, Yamato sovereignty established the governmental and political system of Oomi (大臣) and Omuraji (大連); then, the Heguri clan was selected for the Oomi; and the Otomo and Mononobe clans were selected for the Omuraji. This verified the Yamato sovereignties establishment, to some degree, of the system of Uji (氏) and Kabane (姓). Beginning with late half of the fourth and into the fifth century, the Wa army waged war with the three kingdoms of Korean Peninsula; Paekche, Silla, and Goguryeo. These historical events were inscribed into the "Gwanggaeto Stele. "During this time period, Tsukushi no kuni no miyatsuko Iwai (Local ruling families in ancient Japan) were in touch with Silla and mobilized the surrounded states; thus, preventing an invasion by the Wa army. 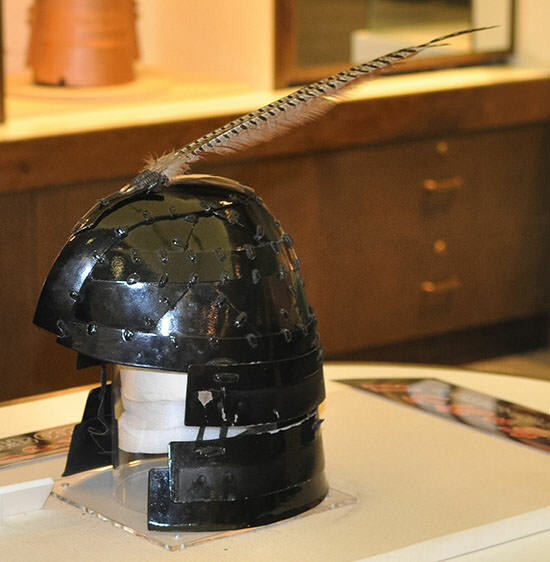 A written record of this incident was recorded in the Nihonshoki "Iwai War (year of 527). "This incident demonstrated that the repeated troop deployment to the Korean peninsula caused severe militaristic and economic burdens upon the local ruling families in Japan; this would lead to the rebellion attempted by Iwai, and was considered to be a byproduct of these warring excursions. Ancient Japan emerged from local states and established an embryonic nation over the ruling period of three Emperors: Emperor Ankan (year of &apos;531&apos; to &apos;535&apos;), Emperor Senka (year of &apos;535&apos; to &apos;539&apos;), and Emperor Kinmei (year of &apos;539&apos; to &apos;571&apos;). Under the sovereignty, &apos;Uji&apos; title name holders were Mononobe clan, Otomo clan, and Soga clan; then, there were official duties: Omi (a hereditary title; originally it was one of the two highest such titles, later demoted to the sixth highest of eight), Muraji (a hereditary title; originally it was one of the two highest such titles, later demoted to seventh highest of eight), kuninomiyatsuko (a hereditary title, and regional administrator), and Gunji (a district official). 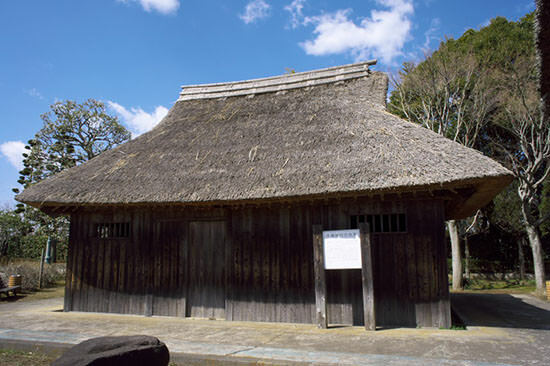 In local provinces, clan families with lineage of the Kibi clan established "Uji" and "Omi," and additional local ruling families established "Bu. "These local ruling classes wielded substantial political power. In the Senka era, the Soga clan became Oomi (great minister) and increased in power, in addition, the Soga clan retained the ministers position by for itself, and held the center of political power during the Emperor Sushun era (year of &apos;587&apos;to&apos;592&apos;). Emperor Sushun was assassinated by a plot of SOGA no Umako in &apos;592&apos;. SOGA no Iname, SOGA no Umako, Soga no Emishi, and SOGA no Iruka, as four members representing the Soga clan, they continued to occupy important political positions until &apos;Isshi no hen (the Murder in the Year of Isshi)&apos; in &apos;645&apos;, for approximately another half century. The Kinmei era saw the preparation, implementation and establishment of the ancient family registration system; this was followed by the kuninomiyatsuko (provincial governor) and Gunji (district official) which were predecessors of state organizations. Additionally, in the Kinmei era, Buddhism was introduced. Buddhism was introduced from Paekche in &apos;538&apos;. Although the "Nihonshoki" stated that the introduction of Buddhism was in year &apos;552&apos;, other historical materials verified that an editor of the "Nihonshoki" had altered the date. The Soga and the Mononobe clans argued over the introduction of Buddhism, but the Soga clan won the argument. 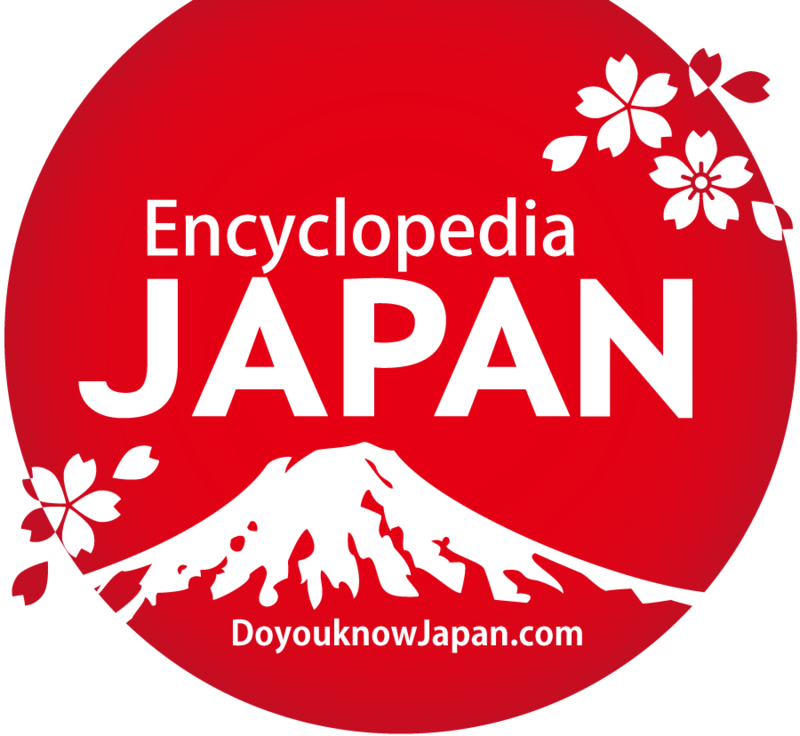 Records indicate that the early to middle Kofun period was the &apos;Period of the Sixteen Kingdoms&apos; (year &apos;316 &apos;to&apos;439&apos; in Northern China; so China was not a unified state at this time. Therefore, historians and experts believed that the sending of an envoy to China and the invitation of a Chinese envoy to Japan did not occur during this time periodHowever, we need to consider the possibility that Japan might have been involved in a trade relationship with Northern China and other countries, from unspecified parts of Japan. However, from the middle to late part of the Kofun period, this Period of Sixteen Kingdoms in China ended; it was the Pei-Dynasty which continued to rule by Northern Wei, Eastern Wei, Western Wei, Northern Qi, and Northern Zhou. Yet, there are no supporting historical materials to confirm diplomacy and trading relationships with Northern China. As to any relationship with the Nan-Dynasty, it is well known that the five kings of Wa were in a sakuho (homage to the Chinese emperor) relationship with Nan-Dynasty.